Online user manual for V5.8/5.9. Click here to view. Updates to V5.8/5.9 have been documented. You will receive an unlock eMail that will contain details of all products registered to you that will also include download details. If you have already downloaded the installation file or have an installation CD you don't need to do so again. The redownload details are provided to enable you can upgrade to the latest version if there has been a version change since you originally downloaded or installed from CD. The best way is to download the latest version and click on Help / Unlock when connected to the web. Autoupdate is the easiest way to ensure that you have the latest version. To check to see if you have the latest version from within EMDR Pro click on "Help" then "Check for updates". Refer to your original download eMail for download instructions if you need to upgrade. If Autoupdate is installed and there is a new version Autoupdate will be automatically run. NB When deinstalling / reinstalling any files that you added and your user profiles (settings) will not be removed. Is the user manual available for printing? The slideshow background effect is a new feature in V2.9.5+ and replaces the previous approach of using very large animated gif files which tended to slow tracking down considerably. When the quality setting is at 100% the background files are displayed "as is" without any form of compression or standardisation. You need to do this if you wish to display an animated gif file. If you don't set the quality to 100% the auto compression facility will compact the animated gif file into a single image. The disadvantage of loading files "as is" is that they will be of differing sizes and qualities. This means that it can be difficult to maintain a constant tracking rate. In most cases you can keep the quality level to the default (about 50%) which means that all files are automatically compressed by 50% and made the same size. This is all done in memory so does not affect your original files at all. Tracking then remains totally constant regardless of the size or quality of the original files. If your original files are very small or already highly compressed then you should consider increasing the quality setting to a higher value. When you change the quality setting you will see the effect instantly applied to the current background image. Corrupted or missing files are simply skipped when the files are initially loaded. 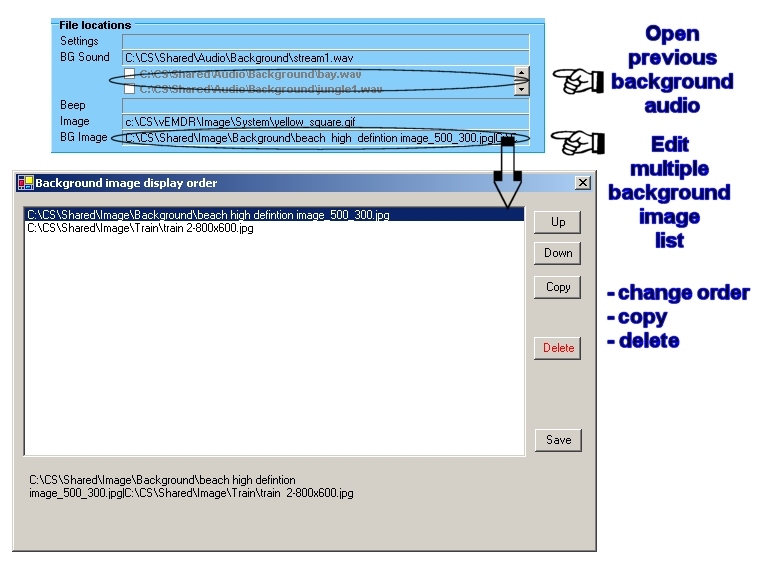 You can also now edit multiple background images - this means that you can change the display order and copy / delete images from the list of images to display. Overall you now have compete control over the display of multiple background images. This feature is more or less as per the slideshow effect for background images and was released to non-test users in Version 4.3. If a media file was missing in the past an information message would have been displayed when opening saved settings files. Are the keyboard shortcuts available for printing? How do I install the new manual without needing to redownload the installation file? The user manual within EMDR Pro has now been rewritten and updated to include all V2.8 features. Click here to preview. Updates to V2.8.7 have been documented. How do I enable transparency? In the image menu part of the GUI click on the word "Opaque" and it will will change to read "Transparent". If you have a background image loaded alter the % visible to anything other than 0%. (0% automatically disables transparency for the benefit of the majority of users). NB Enabling transparency adds a significant overhead to the work that your processor has to do in order to generate smooth movement hence it is advised that you only enable tranparency if you have a fast system. If movement becomes slow or jerky or there is too much sound from your laptop's cooling fan then don't enable tranparency. NB When you first load a background image tranparency is automatically disabled for the benefit of the majority of users. This is the difference between transparency being enabled V disabled. Not all images are capable of supporting transparency eg JPG does not, GIF does but only if a transparency colour has been set. Transparent images will typically have a neutral background colour such as white. Where's the user multi-media library? This is available only on the installation CD. Click here to create the same folder stucture of your hard drive. The above folder structure is automatically setup with later versions of EMDR Pro. V2.4/2.6 Click here for detailed instructions for versions 2.4/2.6. V2.8+ In version 2.8+ the presence of the shared library is automatically detected and the default paths are adjusted accordingly. To disable this uncheck the checkbox in the options window. Where did my beeps and images go? In the first version of version 3.0 only the installer seemed to be skipping the creation of the folder that contains beeps / images and video files. We have now corrected the problem in the installer. If you deinstall ("Start" then "Add/remove programs"), redownload and reinstall the beeps and images will reappear. You do not need to re-enter your unlock code. Move C:\CS\Audio C:\CS\Image and C:\CS\Video into C:\CS\Shared. If you click on the link below and save the following batch file to c:\CS and then select "Run" the above will be done for you automatically. In Internet Explorer click here, save to c:\cs and then select "Run"
The above issue is not present in the current version of the Version 3.0 installer. How do I record using Audacity? If your sound card does not have a "Stereo Mix" "What you can hear" capability but does have a "Mic / Line In" socket then you can use a very cheap 3.5 mm male to male cable to feed headphone output into your line-in socket. You then select "Mic / Line In" as the source to record from. Additionally on some systems with some headsets it may not be possible to bilaterally pan mono files using the background sound player. The large media player should be used instead.